Georgia: Web Library of Links Republic of Georgia: Web Library of Links: How to buy "5 Days of August" ("5 Days of War", "Georgia") original DVD from Amazon? 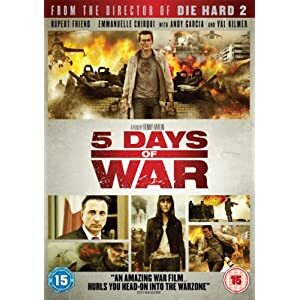 How to buy "5 Days of August" ("5 Days of War", "Georgia") original DVD from Amazon? If you were trying to find this movie in stores and online you've probably realized that it's not yet available. Most websites I visited either don't have it or say that it will be released later this year. However, the good news - you still can order it now, original DVD and it is just for $16 USD with shipping fees to the US. From Amazon! (to be precise, from Amazon.co.uk). Although it is a UK online store they can easily deliver to the US or elsewhere (excluding may be few countries like Cuba or North Korea). Click on this link and it will take you to the amazon.co.uk website. They have price in British pounds (7.93) but they charged me less (about 6 pounds) when I requested delivery location in US. After conversion and delivery fees final price was about $16 USD which I think is a good deal for the original DVD of "5 Days of August", "5 Days of War" or how Netflix calls it on its website, "Georgia" (2010). One small catch - this is a pre-order and Amazon says that shipping can happen on or after June 13, 2011. Today is June 11 and I think I can easily wait just for 2 days. And by the way, amazon.co.uk delivery to US usually takes 10-12 days. So my order should be at my place by June 25 latest. I heard from many who watched "5 Days of August" in movie theaters that it's not an easy watch and emotionally some times very difficult, especially if you know Georgia, Georgian people and have any relationship with Georgia. Anyway, I wish everyone who will be watching "5 Days of August" movie to enjoy it and have good time. Renny Harlin is a great filmmaker and I am sure the movie won't disappoint us.